Jean-Claude Juncker was hailed as a hero by European business yesterday for making Donald Trump blink and withdraw a threat to slap punitive import tariffs on EU cars and so escalate a trade war. The White House deal is one to savour for the European Commission president, two weeks after doubts were raised, notably in Germany, over his fitness for the job after he was taken unwell during a Nato summit where the US president trashed his European allies. The former Luxembourg premier and 30-year veteran of EU backroom haggling and his aides stressed the limits to what was achieved – well aware of Trump’s ability to change tack. And though Germany cheered that Mr Juncker had bought their carmakers time while talks are launched on freeing up trade, France sounded more cautious on possible new US farm imports. Yet there was widespread praise among European governments and business for the Commission’s strategy, in renewing offers that Trump had dismissed in the past for more free trade talks and sticking to its own threat of retaliation against US products by the world’s biggest economic bloc. There was appreciation too for Mr Juncker’s personal charm offensive. 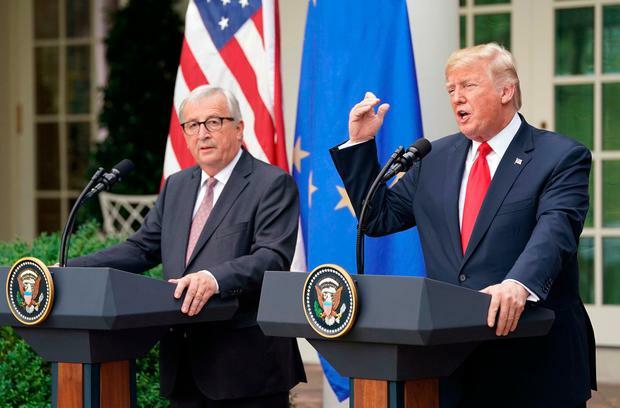 A photograph of Mr Juncker planting one of his trademark kisses on Trump’s cheek at the White House set the tone, prompting the US president to tweet about “love” across the Atlantic. “A lot of love went into their preparations,” a Brussels diplomat from one EU member state said. “Juncker knows how to tame Trump” wrote Vienna’s left-leaning ‘Der Standard’, calling the deal a “masterpiece”. Mr Juncker, who has not spared his criticism of Mr Trump in public or private, also clearly thought about how to break the ice and presented the US President with a framed array of photographs showing US war graves in his native Luxembourg – including that of one of Trump’s personal heroes, General George Patton. “Dear Donald, we have history in common,” Juncker wrote and later expanded on the theme of shared values. It was all rather different in tone from a comment by Juncker last month when he said Trump had called him a “brutal killer”. Mr Juncker told the ‘Politico’ news website that talks had been helped “by the fact that we get along well, surprisingly” and that he had spoken his mind – firmly but politely – at last month’s G7 summit. “He doesn’t like those who beat about the bush,” Mr Juncker said. One senior EU official said Mr Trump’s team appeared to have been tempted by offers to increase EU imports of liquefied natural gas and soybeans and co-operate on challenging China’s trade practices.